The DCH481X2 60V Max Brushless 1-9/16" SDS Max Combination Hammer is a light weight high-performance hammer that is powered by a DEWALT brushless motor and durable German engineered mechanism. The DCH481 delivers 6.1 joules of impact energy for fast drilling, even in the hardest concrete. The light weight design makes it ideally suited for horizontal serial drilling for #4 - #8 rebar, dry coring and chipping in any mid to upper wall and ceiling application. The patented E-Clutch system provides enhanced control to the user in a bind up situation and can help minimize sudden torque reaction compared to standard clutches. The Active Vibration Control technology employed delivers reduced user vibration for less user fatigue and greater productivity. 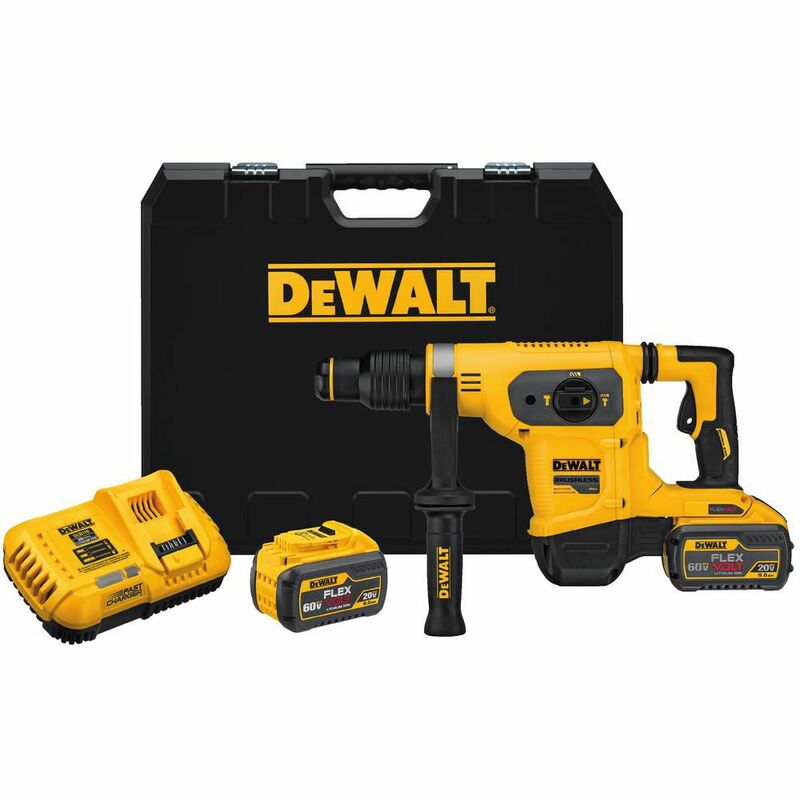 FELXVOLT 60V MAX 1-9/16 Inch SDS Combination Hammer Kit The DCH481X2 60V Max Brushless 1-9/16" SDS Max Combination Hammer is a light weight high-performance hammer that is powered by a DEWALT brushless motor and durable German engineered mechanism. The DCH481 delivers 6.1 joules of impact energy for fast drilling, even in the hardest concrete. The light weight design makes it ideally suited for horizontal serial drilling for #4 - #8 rebar, dry coring and chipping in any mid to upper wall and ceiling application. The patented E-Clutch system provides enhanced control to the user in a bind up situation and can help minimize sudden torque reaction compared to standard clutches. The Active Vibration Control technology employed delivers reduced user vibration for less user fatigue and greater productivity. FELXVOLT 60V MAX 1-9/16 Inch SDS Combination Hammer Kit is rated 4.8 out of 5 by 23. Rated 5 out of 5 by Whoman from Made quick work of tile removal from a bathroom I... Made quick work of tile removal from a bathroom I was remodeling. Lasted a single battery charge. Working on removal of brick wall and still no let down. Battery wait takes a little getting used to, however more overall freedom and mobility. Rated 5 out of 5 by toolman from Was what I expected. Good power without the cord.... Was what I expected. Good power without the cord. Would recommend. Rated 5 out of 5 by Emanuel from Just what we needed to drill a 21” hole through... Just what we needed to drill a 21” hole through concrete and brick. Rated 5 out of 5 by MuseumMan from Love that we're able to use this without cord and that there are other tools that we have or can ... Love that we're able to use this without cord and that there are other tools that we have or can buy to use the same platform!!! Rated 5 out of 5 by LentineSpecialties from Nice and smooth operation! Cordless is the way to go.... Nice and smooth operation! Cordless is the way to go. The batteries lasts long enough for basic slab removal projects.